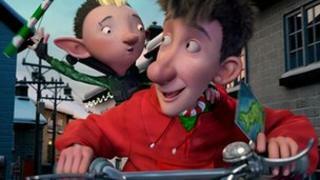 Animated film Arthur Christmas has leapt back to the top of the UK and Ireland box office chart in its seventh week of release. The family comedy, which features the voice of James McAvoy as Santa Claus's youngest son, climbed two spots taking £2.05m. It overtook last week's top two films, Sherlock Holmes: A Game Of Shadows and Alvin And The Chipmunks: Chipwrecked. The festive boost brings the film's total box office haul to £19.7m. Takings were generally down for the weekend as cinemas were closed on Christmas Day so only two days of box office receipts were recorded. Shrek prequel Puss In Boots held firm at number four as did A-list ensemble romantic comedy New Year's Eve at five. The only new entry in the chart was Indian action sequel Don 2, starring Shah Rukh Khan, at six. Screened at just 76 cinemas, the film averaged £4,204 per location. By comparison, Arthur Christmas averaged £3,729 from the 549 cinemas it was screened in. Falling one position each were Martin Scorsese's Hugo at seven, Happy Feet Two at eight and The Twilight Saga: Breaking Dawn Part 1 at nine. Rounding out the top 10 was 1946 festive classic It's A Wonderful Life, starring James Stewart, taking £74,462 after screening at 50 cinemas.